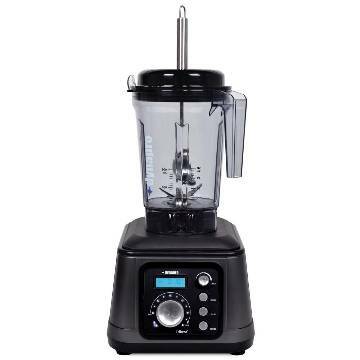 The Dynapro features a powerful 2.5 HP motor, integrated 4-spoke blending blade, a large 64 oz. container, and a vacuum blend option. The Dynapro Vacuum Lid is designed to work with the included handheld Vacuum Pump, to reduce oxidation by removing air before blending. With less oxidation, you can enjoy more nutrients and enhanced flavors in your smoothies. The Dynapro’s blending container includes a unique thermo-chromatic ink raw temperature indicator that helps you maintain a raw temperature in your blend. The blue mark changes to white at 118°F and above. The Dynapro offers unparalleled convenience with 3 modes of operation: manual, countdown timer, and 3 one-touch preset buttons, as well as a variable speed dial for total control over your blend. The Dynapro’s blending container includes a unique thermochromatic ink raw temperature indicator that helps you maintain a raw temperature in your blend. The blue mark changes to white at 118°F and above. The Dynapro has a specially designed 4 point cross stainless steel cutting blade that blend, grind and pulverize ingredients. The new blade assembly is sure to offer you many years of dependable service. The specially designed lid and pump allow you to remove all the excess air inside the blending pitcher to ensure your ingredients are not bombarded with excess oxygen that can change the color, add air bubbles and lower the nutrition of the food your are blending.